Whatsoever is firstborn of all flesh, which they offer to the Lord, whether it be of men, or of beasts, shall belong to thee: only for the firstborn of man thou shalt take a price, and every beast that is unclean thou shalt cause to be redeemed, And the redemption of it shall be after one month, for five sicles of silver, by the weight of the sanctuary. A sicle hath twenty obols. Note that "firstborn" means "the the male child that opens the womb," not "the first of a series of children born." Therefore, the Protestant objections to Mary's eternal virginity based on references to Jesus as "firstborn" are totally without foundation. Note also that the Holy Family must've been poor as Our Lady offered birds rather than the lamb, as the Leviticus verses above indicate is the way of the poor. And Simeon blessed them, and said to Mary his mother: Behold this child is set for the fall, and for the resurrection of many in Israel, and for a sign which shall be contradicted; And thy own soul a sword shall pierce, that, out of many hearts, thoughts may be revealed. This prophecy and the sorrows that befell the Virgin during her time on earth are why depictions of the Immaculate Heart almost always show her or her heart itself being pierced by a sword. Depictions of Our Queen as the Mother of Sorrows (Mater Dolorosa) often show her being pierced by seven swords, one for each of her Seven Sorrows. Now, before Simeon gave this prophecy to Our Lady, he referred to her Infant Son as the Light to the revelation of the Gentiles, and because of this, light and candles play an important role before and during the Mass, hence the most common name for this Feast -- "Candlemas." ...if we will appear in this feast tofore the face of God, pure and clean and acceptable, we ought to have in us three things which be signified by the candle burning: that is good deeds, true faith, with good works. And like as the candle without burning is dead, right so faith is dead without works as Saint James saith, for to believe in God without obeying his commandments profiteth nothing. And therefore saith Saint Gregory: The good work ought to show withoutforth that thy intention abide good withinforth the heart, without seeking within any vain glory to be allowed and praised. And by the fire is understood charity, of which God saith: I am come to put fire in the earth, and whom I will, I will burn. The candle blessing -- one of the three principle blessings of the liturgical year, the others being the blessing of palms and ashes -- will be given by the priest wearing a purple cope. He will pray 5 prayers over the candles placed near the Altar. The candles are sprinkled three times while the Asp�rges me is sung, and then they are incensed and distributed. When we take a blessed candle from the priest's hand, we kiss the candle and then the priest's hand, just as we do on Palm Sunday when we kiss the palm and then the priest's hand when receiving the blessed palms. There follows a procession with the lighted candles and the singing of anthems. Then the Mass begins, and the lighted candles are held during the reading of the Gospel and from the beginning of the Canon of the Mass to Communion. Nor hurts of frost or hail. May Christ protect us from all storms and lightning. + Christ went through their midst in Peace, + and the Word was made Flesh.+ Christ is with us with Mary.+ Flee you enemy spirits because the Lion of the Generation of Juda, the Root David, has won.+ Holy God! + Holy Powerful God! + Holy Immortal God! + Have mercy on us. Amen. In Poland, the candles brought from home to be blessed are decorated with symbols and ribbons. There, the custom is to let a blessed candle burn all night tonight before an icon of Our Lady who, when the world still had forests, was relied upon to keep the wolves away during these cold nights. Now, our "wolves" tend to be of a different sort, but the pious burning of a blessed candle tonight, with prayers offered to Our Lady, still might help keep them at bay. This tradition gives Candlemas its Polish name -- "Matka Boska Gromniczna," or "Mother of God of the Blessed Thunder Candle." 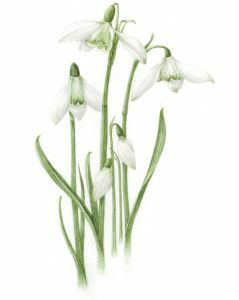 Snowdrops (Galanthus nivalis) are known as "Candlemas Bells" because, being the usual earliest blooming flower of all, they often bloom before Candlemas (some varieties bloom all winter long in some places). Legend says that they sprang up by the hand of an angel, who then pointed them out as a sign of hope to Eve, who was weeping in repentance and in despair over the cold and death that entered into the world after she and her husband sinned. Because our Hope is Christ, the Light of the World as Simeon says in his canticle today, it is providential that the snowdrop should bloom by this Feast! If possible, gather some Candlemas Bells to bring inside (folk belief is that bringing them indoors before this date is bad luck, and bringing them indoors today "purifies" one's house.) These flowers, along with carnations, are also the "birth flower" for those born in January. Stir the ingredients smoothly to the consistency of olive oil, or until it will pour back silently and smoothly from a foot or more above the mixing bowl. Remember this is a French pancake and must be thin. Put 1 teaspoon of butter into a small round-bottomed frying pan (not aluminum) and when it bubbles pour in enough paste to cover the bottom of the pan. Be quick in moving the pan so as to spread the paste thinly. Keep the pan moving; that paste is a delicate substance. After 1 minute turn the pancake over, then turn it again and again until it is nicely browned. Fold the circle in half, then again to form a triangle. Make eight of these, which should serve four. This first step is a smoky one and should be done in the kitchen. The pancakes, however, are to be cooked a second time, a procedure which occurs in the dining room. Note that when it comes time to turn the pancake over, there's a French tradition of doing so while also flipping a fine coin (in the manner you'd flip a coin to determind heads or tails) in your other hand. If you're able to do both at the same time, then good luck follows. It could be great fun to have any guests you might have gather in the kitchen to try their hand at mastering the flipping of both at the same time! This sauce should be made in advance since it keeps for many months without spoiling. It can be made in great quantities; like good wine, it will improve with age. Vanilla sugar is one of the requisites for a fine cuisine. Put three or four vanilla beans in a quart jar of granulated sugar. After several days the sugar will be delicately flavored by the vanilla in the beans. With a knife peel 2 oranges and 1 lemon so thin that the pulp remains on the fruit. Cut the peel julienne style and mix it with 4 tablespoons of vanilla sugar. Squeeze the strained juice of the 2 oranges and 1 lemon into a chafing dish. Add the vanilla sugar, etc. and 1/8 pound of butter. Let it come to a boil and then add 1 teaspoon of orange blossom water, 2 ponies* of kirsch, 2 ponies of white curacao, 2 ponies of rum and 1 pony of maraschino. When it comes to a boil, remove it from the fire. This is the sauce which, if prepared in advance, will keep indefinitely. Serve whatever Candlemas foods you eat today with candles burning everywhere! The eve of this Feast is the absolutely last (and best) day for taking down the Christmas tree, putting away the creche, etc. In some Latin countries, the creche isn't just put away, but is replaced with a figure of the Child Jesus sitting on a chair, acting as a sign that it is time for the devotion to the Divine Childhood to give way to a focus on the grown-up Savior and the public ministry, forty days of fasting, and Passion to come. This very ancient carol also speaks of the departure of Christmas on this day. It is called "I Am Christmas," and was written by James Ryman, a Franciscan Friar, ca. 1492. Note that the reference to Hallowtide (the days of the dead centering around All Saints Day) here refers to the fact that it was during Hallowtide that monarchs used to announce where they would be spending Christmas. he will crawl back into his hole for another six weeks. Winter will be long for sure. Spring is not yet near. German immigrants to the United States brought their Candlemas traditions with them when they settled in Punxsutawney, Pennsylvania. Each year, a great to-do is made over the town's official groundhog, "Punxsutawney Phil," emerging from his den to predict the weather, said prediction being broadcast by all the major media in the U.S.A. The movie "Groundhog Day," starring Bill Murray and Andie MacDowell, centers around an endless Groundhog's Day in Punxsutawney, a town located at the intersection of Rt.36 and Rt.119 in western Pennsylvania. Excerpt from "Homily on Our Lord"
48. Now Simeon the priest, when he took Him up in his arms to present Him before God, understood as he saw Him that He was not presenting Him, but was being himself presented. For the Son was not presented by the servant to His Father, but the servant was presented by the Son to his Lord. For it is not possible that He, by Whom every offering is presented, should be presented by another. For the offering does not present him that offers it; but by them that offer are offerings presented. So then He Who receives offerings gave Himself to be offered by another, that those who presented Him, while offering Him, might themselves be presented by Him. For as He gave His body to be eaten, that when eaten It might quicken to life them that ate Him; so He gave Himself to be offered, that by His Cross the hands of them that offered Him might be sanctified. If there was no grace wrought on him, why then did he give thanks? But rightly did he give thanks, that he was thought worthy to receive in his arms Him, Whom angels and prophets greatly desired to see. For lo! mine eyes have seen Thy mercy. Let us understand then and see. Is mercy that which shows mercy to another, or is it that which receives mercy from another? But if mercy is that which shows mercy to all, well did Simeon call our Lord by the name of the mercy that showed mercy to him, Him Who freed him from the world which is full of snares, that he might go to Eden which is full of pleasures; for he who was priest said and testified that he was offered as an offering, that from the midst of the perishing world he should go and be stored up in the treasure-house which is kept safe. For one for whom it may be that what he has found should be lost, to him it belongs to be diligent that it should be kept safe. But for our Lord it could not be that He should be lost; but by Him the lost were found. So then, through the Son Who could not be lost. the servant who was very desirous not to be lost, was presented. Lo! mine eyes have seen Thy mercy. 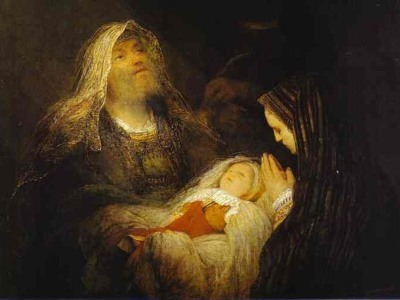 It is evident Simeon received grace from that Child Whom he was carrying. For inwardly he received grace from that Infant, Whom openly he received in his arms. For through Him Who was glorious, even when He was carried, being small and feeble, he that carried Him was made great. 50. So likewise the ship that carried our Lord; it was He that bare it, in that He stayed from it the wind that would have sunk it. Peace, for thou art shut up. While He was on the sea, His arm reached even to the fountain of the wind, to shut it up. The ship bare His manhood, but the power of His Godhead bare the ship and all that was therein. But that He might show that even His manhood needed not the ship, instead of the planks which a shipwright puts together and fastens, He like the Architect of creation, made the waters solid and joined them together and laid them under His feet. So the Lord strengthened the hands of Simeon the Priest, that his arms might bear up hi the Temple the strength that was bearing-up all; as He strengthened the feet of Simeon the Apostle, that they might bear themselves up on the water. And so that name which bore the first-begotten in the Temple was afterwards borne up by the first-begotten in the sea; that He might show that as in the sea the drowning was borne up by Him, He did not need to be borne by Simeon on the dry ground. But our Lord bare Simeon up openly in the midst of the sea to teach that also on the dry land He supported him secretly. 51. Accordingly, the Son came to the servant; not that the Son might be presented by the servant, but that by the Son the servant might present to His Lord Priesthood and Prophecy, to be laid up with Him. For prophecy and priesthood, which were given through Moses, were handed down, both of them, and reached to Simeon. For he was a pure vessel, who sanctified himself that he might be like Moses, capable for both of them. There are small vessels which are capable for great gifts. There are gifts for which one is capable, by reason of their. grace; yet many are not capable for them, by reason of their greatness. Thus, then, Simeon presented our Lord, and in Him offered both these things; so that that which was given to Moses in the wilderness, was received from Simeon in the Temple. But seeing that our Lord is the vessel wherein all fulness dwells, when Simeon was offering Him before God, he poured over Him as a drink-offering those two gifts, priesthood from His hands and prophecy from His lips. Priesthood continued to oil the hands of Simeon, because of his purifications; and prophecy dwelt in operation upon his lips, because of revelations. When then these two powers saw Him who was Lord of both, they two united together and poured themselves into the vessel that was capable of both; that could contain priesthood and kingdom and prophecy. That Infant then, who was wrapped in swaddling clothes, because of His graciousness, clothed Himself in priesthood and prophecy because of His Majesty. For Simeon clothed Him in these, and gave Him to her who had wrapped Him in swaddling clothes. For when he gave Him to His mother, he gave along with Him the priesthood; and when he prophesied to her concerning Him, This Child is set for the fall and rising again, he gave prophecy also with Him. 52. Then Mary received her firstborn and went forth. 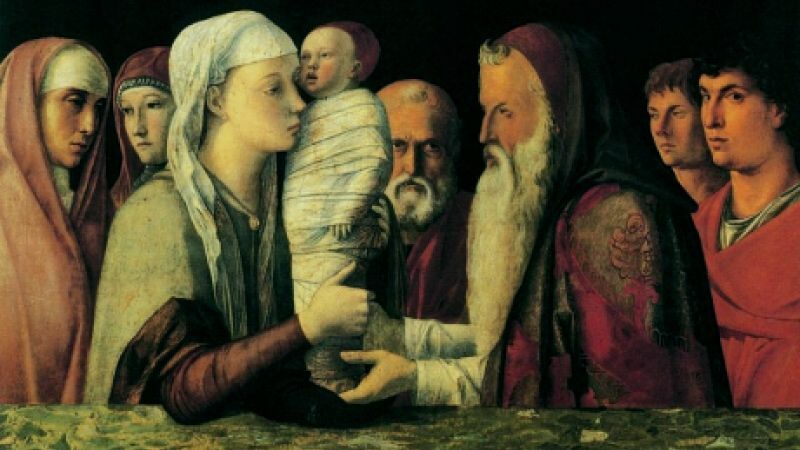 He was outwardly wrapped in swaddling clothes, but secretly He was clothed with prophecy and priesthood. Whatsoever then was handed down from Moses, was received from Simeon, but continued and was possessed by the Lord of both. So then the steward first, and the treasurer lastly, handed over the keys of priesthood and prophecy to Him who has authority over the treasurer of them both. Therefore, His Father gave Him the spirit not by measure, because all measures of the spirit are under his hand. And that our Lord might show that He received the keys from the former stewards, He said to Simeon [Simon Peter]: To thee I will give the keys of the doors. But how should He have given them to another, had He not received them from another? So, then, the keys which He had received from Simeon the priest, them He gave to another Simeon the Apostle; that even though the People had not hearkened to the former Simeon, the Gentiles might hearken to the latter Simeon. 53. But because John also was the treasurer of baptism, the Lord of the stewardship came to him to receive from him the keys of the house of reconciliation. For John used to wash away in common water the blemishes of sins; that bodies might become meet for the garment of the Spirit, given by our Lord. Therefore, because the Spirit was with the Son, He came to John to receive from him baptism, that He might mingle with the visible waters the invisible Spirit; that they whose bodies should feel the moistening of the water, their souls should feel the gift of the Spirit; that even as the bodies outwardly feel the pouring of the water upon them, so the souls inwardly may feel the pouring of the Spirit upon them. Accordingly, even as our Lord when He was baptised, was clothed in baptism and carried baptism with Him, so also when He was presented in the Temple, He put on prophecy and priesthood, and went forth bearing the purity of the priesthood upon His pure members, and bearing the words of prophecy in His wondrous ears. For when Simeon was sanctifying the body of the Child who sanctifies all, that body received the priesthood in its sanctification. And again, when Simeon was prophesying over Him, prophecy quickly entered the hearing of the Child, For if John leaped in the womb and perceived the voice of the Mother of our Lord, how much more should our Lord have heard in the Temple? For lo! it was because of Him that John knew so as to hear in the womb. 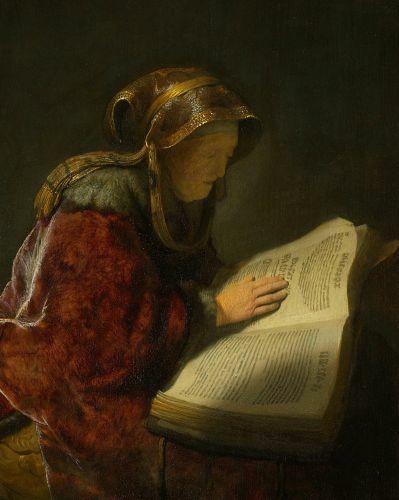 And anon she fell asleep, in which she had a vision, and her seemed that she was in a church, and saw come into the church a great company of virgins, tofore whom she saw come a right noble virgin crowned right preciously. And when they were all set each in order, came a company of young men which sat down each after other in order like the other; after, entered one that bare a burden of candles, and departed them to them above first, and so to each of them by order he gave one, and at the last came this man to this lady aforesaid and gave to her also a candle of wax. The which lady saw also come a priest, a deacon and a subdeacon, all revested, going to the altar as for to say mass. And her seemed that S. Laurence and S. Vincent were deacon and sub-deacon, and Jesu Christ the priest, and two angels bearing tofore them candles, and two young angels began the introit of the mass, and all the company of the virgins sang the mass. And when the mass was sung unto the offering, her seemed that thilk virgin so crowned went tofore, and after, all the others followed, and offered to the priest, kneeling much devoutly, their candles. And when the priest tarried for this lady that she should also have come to the offering, the glorious queen of virgins sent to her to say that she was not courteous to make the priest so long to tarry for her. And the lady answered that the priest should proceed in his mass forth, for she would keep her candle and not offer it. And the glorious virgin sent yet once to her, and she said she would not offer her candle. Let us pray then humbly to the glorious Virgin Mary, which is comfort to them that forsake their sins, that she will make our peace to the blessed Son and impetre and get of him remission of all our sins, and after this life to come to the glory and joy of heaven, to the which bring us the Father, the Son, and the Holy Ghost. Amen.